Digital loyalty startup Chatterfly today launched its new rewards program for businesses and consumers in the form of a smartphone application for iPhone and Android. Like similar startups, including the now Google-owned Punchd, Chatterfly aims to replace the paper loyalty card with a more modern, digital version. But Chatterfly isn’t only focused on making businesses’ punchcards mobile. It’s a complete loyalty system that offers business owners the opportunity to engage their customers in other ways, including through social media sites, via QR codes, in-store promotions and more. As with any traditional loyalty program, businesses on Chatterfly can reward customers for making purchases in the store, but they can also reward them for sharing their experiences on social sties like Facebook, Twitter, Foursquare and Google+. With Chatterfly, customers earn points, which is a different model than the typical “buy 10 get 1 free” model that’s popular today. These points can either be redeemed at the local business or for Chatterfly’s own rewards – the choice is up to the consumer. And because it works as a mobile application, Chatterfly can take advantage of the smartphone’s camera to scan special QR codes tied to promotions. For example, the company suggests that a store could host an in-store scavenger hunt to entice new customers to drop by. Or, if the business wanted to do something simpler, it could just offer points to those who scan a QR code in the shop. On its own, the idea of rewarding loyalty customers is a good one, but the app itself needs quite a bit of polish, we think. Black-and-white pictures? Uneven layout? Yikes. Of course, there’s still the challenge of convincing business owners to actually use the service, too. But Chatterfly is a little bit ahead there. Prior to launching, the company ran beta tests in the San Francisco Bay area with over 100 businesses, and said it received many positive responses. The company itself is based in San Mateo, where it was founded in June 2010 by Charles Michael Yim, formerly in business development at Fortify Software. It is privately funded. 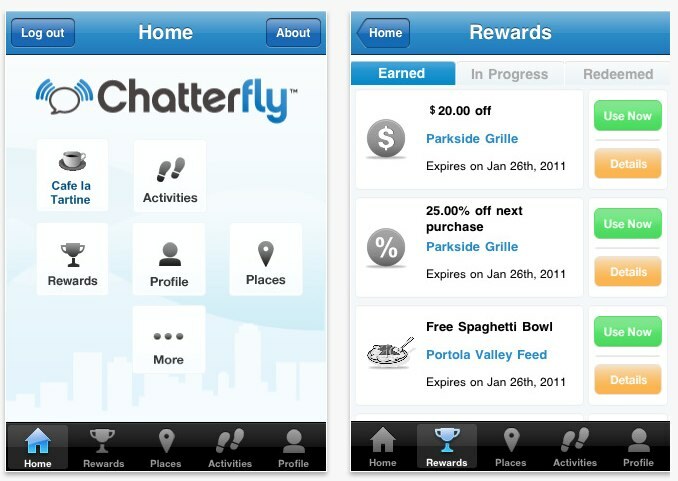 Chatterfly says the iPhone and Android versions of the app are available now and more platforms are coming soon.